WebSearch University is back in Washington, D.C., and offers the perfect opportunity to learn from world-class power searchers. The curriculum will enhance your search creativity, provide essential information about changes in search engines, introduce new resources, and put it all in context for serious researchers—information professionals, librarians, freelancers, journalists, and information managers. 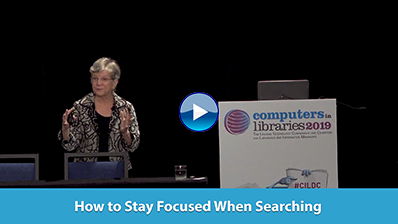 Learn how to turn your search into research at WebSearch University! In 2000, I wrote a NewsBreak article that considered the first addition by the Internet Corp. for Assigned Names and Numbers (ICANN) of new generic top level domain names (gTLDs). TLDs are divided into two basic types: generic top level domains (gTLD) and country code TLDs (ccTLD). ICANN has since followed this first wave of new gTLDs with a set of gTLDs and sponsored TLDs (sTLD) in 2004. ICANN is again broadening opportunities to create new gTLDs to include sTLDs. In June 2011, ICANN announced a policy to liberalize the process for creation of new gTLDs. R.R. Bowker and Publishers Weekly released the 2010-2011 U.S. Book Consumer Demographics & Buying Behaviors Annual Review. A weakened economy, declining numbers of book buyers, and the acceleration of ebooks seemingly combined to make 2010 one of the most challenging ever for the U.S. book industry. Innovative Interfaces announced that 25 academic and public libraries entered into agreements to be partners in or early implementers of the company's Sierra development initiative. The Sierra Services Platform will provide complete, customizable ILS functionality with the power and scale of modern software architecture. Sierra's beta launch is scheduled for late 2011. AllBusiness.com, a D&B company, announced a dramatic new redesign, including new site organization, new content filters, comments and ratings functionality, and new columnists and bloggers. Intended to give AllBusiness.com a fully up-to-date look and feel as well as introduce new content and functionality, the redesign is the catalyst for all sorts of changes, some of which will be rolled out in the coming weeks and months.